With the holiday season in full swing, you may be hosting family and friends for winter gatherings, so you'll need to make sure that your guest rooms are up to snuff. If your guest bathroom has seen better days, there are some quick and easy improvements that can revitalize the look of the space. While you may not have enough time to go out and install a brand-new bathroom vanity, you can improve your existing surface quite easily according to Better Homes and Gardens. Start by replacing the existing hardware, such as faucets and dials, to give the space a modern aesthetic. Storage and hanging space is also paramount in a guest bathroom, as your loved ones will need a place to put all of their belongings. Install some additional shelving on either side of your bathroom vanity, as well as towel racks and small baskets to cut down on clutter. Lastly, don't forget a few green plants as a finishing touch to give the room a bit of vitality. 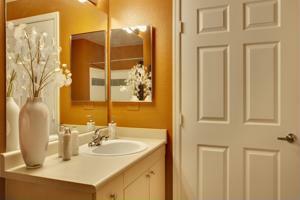 What updates will your guest bathroom need just in time for the holidays?